Plan B refers to an alternative strategy for accomplishing a desired objective. This topic came to mind when reading an article (listed first in the Views section) about Europe’s urgent need for a Plan B. An American Plan-B expert, Lester R. Brown, is a noted environmental analyst, founder-president of the Earth Policy Institute and author of more than 50 books, including Plan B 4.0: Mobilizing to Save Civilization (2009), which elaborated on his previous writings. What sticks out in the happiness rankings are some recurring features associated with the top eight countries, beginning with first-place Switzerland, and followed in order by Iceland, Denmark, Norway, Canada, Finland, the Netherlands and Sweden. So what do these countries have in common? The first thing I notice is their geographical sizes and populations, which trend from small-to-moderate. Iceland and Canada are large geographically but have relatively small populations. Second, a majority of governments function under democratic socialist guidelines, with economies based on high taxes from citizens and corporations, taxes that are used to provide state-supported services like free health care, low-cost education (free tuition in most cases), social security, and other social services. Third, They’re also mostly secular, liberal nations with a healthy regard for separation of church and state, which means they generally lack politically powerful religious institutions. But the danger that threatens the traditional homogenous makeup of European countries is the growing influx of foreigners with strong religious and cultural traditions. Muslim immigrants (and refugees), an ethnic groups that generally holds fast to religious and cultural traditions, is having a particularly difficult time assimilating into western culture. So this is where the European Plan B becomes relevant, both from liberal and conservative viewpoints. Liberals want to open their borders to Muslim refugees, while conservatives want to close borders and even deport a majority of Muslims. Sounds familiar, doesn’t it? A few extremist presidential candidates are awakening us to the ignorance, intolerance, and racism that many Americans vent against those who differ from them, or with them. Without a doubt, the U.S.—and the entire world—desperately needs a viable Plan B, one that’s founded on fundamental human values and worthy, achievable goals. The process of developing a Plan B will involve: seeking a wide range of experts in all fields of knowledge; accumulating all relevant, inclusive information; using our highest forms of critical reasoning and creative imagination in forming constructive, long-term plans; and, finally, cooperating and collaborating civilly with all parties to create a planet that is capable of sustaining all life forms, including us humans and our world civilization. > Resilience: Europe Needs A Plan B: Radical Political Change Is Coming (Steve Rushton). A European left-wing progressive movement is gathering momentum. Labeled Plan B, it could be said to ask as many questions as it answers. What it makes clear, however, is that Europe as an economic and political structure will die unless radical change here happens fast. On the current course, many see fascism rising and austerity deepening, with more authoritarian governance settling in for the long-term. One of the main debates at the gathering was whether progressives should transform Europe – or whether countries should regain full sovereignty and exit Europe to create a socially progressive future on their own terms. > The Conversation: Meltdown Earth: The Shocking Reality Of Climate Change Kicks In—But Who Is Listening? (James Dyke). 2014 was the warmest year recorded by humans, and 2015 was warmer still. January 2016 broke the record for the largest monthly temperature anomaly. Then came February, which didn’t only break climate change records – it obliterated them. Regions of the Arctic were more than 16-degrees Centigrade warmer than normal. But what is really making people stand up and notice is that the surface of the Earth north of the equator was 2-degrees C warmer than pre-industrial temperatures, a line that was not be crossed. We are currently swamping the Earth’s ability to absorb greenhouse gases. 2015 saw the largest annual increase in carbon dioxide since records began – far higher than the Earth has experienced for hundreds of thousands of years. > The Financial: US Concern About Global Warming At Eight-Year High (Lydia Saad, Jeffrey M. Jones). Americans are taking global warming more seriously than at any time in the past eight years, according to several measures in Gallup’s annual environment poll. Most emblematic is the rise in their stated concern about the issue. Sixty-four percent of U.S. adults say they are worried a “great deal” or “fair amount” about global warming, up from 55% at this time last year and the highest reading since 2008. That finding relates to another record broken in the new poll—the 65% of Americans now saying increases in the Earth’s temperature over the last century are primarily attributable to human activities rather than natural causes. This represents a striking 10-percentage-point increase in the past year and is four points above the previous high of 61% in 2007. > Cassandra Legacy: The Climate Emergency: Time To Switch To Panic Mode? (Ugo Bardi). James Schlesinger once uttered one of those profound truths that explain a lot of what we see around us: “People have only two modes of operation: complacency and panic.” In response to what’s happening with the ongoing spike in CO2 and worldwide temperatures, nobody can say for sure. But these are very bad symptoms, so they might be a good reason to switch to panic mode. With the emphasis on doing “something”, without much concern about whether it is the right thing to do and what the consequences might be, conflicts could cause people to react violently. A possible panic-induced solution might lie in “”biosphere regeneration“, which includes reforestation, fighting desertification, regenerative agriculture and the like. > Concord Monitor: My Turn: The Story Behind The Death Of Recycling (Carl Hultberg). Single-stream recycling is brilliant, making everyone look like geniuses – easier, cheaper and everyone’s getting paid. Meanwhile, nonprofits (like NRRA in New Hampshire) warned of obvious realities: mixing paper products and food containers makes trash, and fuel costs and markets for recyclables fluctuate (you know, the usual un-American leftist stuff). Then of course that perfect storm occurred, which the originators of single stream could never have predicted: foreign markets dried up, the price of oil went down (making plastics worthless) and folks getting free recyclable collection but paying for their trash – now getting weighed on the automated truck – put all kinds of stuff into their much bigger free recycling bins. > Yes! Magazine: More Confessions Of An Economic Hit Man: This Time, They’re Coming For Your Democracy (Sarah Van Gelder, Interview). John Perkin’s new book, New Confessions of an Economic Hit Man is based on his original career convincing heads of state to adopt economic policies that impoverished their countries and undermined democratic institutions. These policies helped to enrich tiny, local elite groups while padding the pockets of U.S.-based transnational corporations. He claims that “the cancer of the corporate empire has metastasized into what I would call a failed global death economy. This is an economy that’s based on destroying the very resources upon which it depends, and upon the military. It’s become totally global, and it’s a failure . . . We of course in the U.S. have seen how our government is frozen, it’s just not working. It’s controlled by the big corporations, and they’ve really taken over”. > US News: World Happiness Report Ranks World’s Happiest Countries (Lauren Boyer). How happy is your homeland? Switzerland ranks No. 1, trailed by Iceland, Denmark, Norway, Canada, Finland, the Netherlands and Sweden. America ranks 15th, a slight improvement from last year. 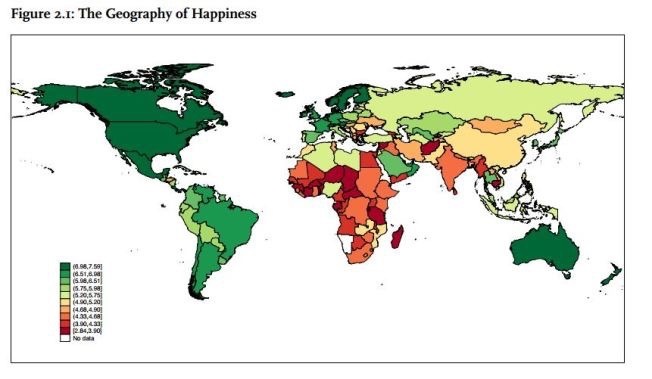 The saddest or least “happy” countries include Togo, Burundi, Syria, Benin and Rwanda. > Washington Post: As temperatures soar, new doubts arise about holding warming to 2 degrees C (Chris Mooney). According to NASA data, February 2016 was the most anomalously hot month the Earth has seen since record keeping began — fully 1.35 degrees Celsius (2.43 degrees Fahrenheit) warmer than the average from 1951-1980. Fortunately, temperatures aren’t expected to stay this high — we are at a peak moment for the effect of El Nino on the atmosphere. The Earth should cool somewhat as more neutral conditions return. But long-term warming won’t abate, and these milestones, 1.5 and 2 degrees Celsius, now feel much closer, and much more real, than ever before. At the same time, meanwhile, two pieces of new research have questioned whether, from an energy standpoint, keeping long term warming below 2 degrees C is even likely to be possible. > MinnPost: Tracing The Climate-Change Roots Of Awful Weather, A New Science Advances (Ron Meador). Humankind’s globe-warming activities are clearly amplifying severe weather events, and an era of uncertainty about this cause-and-effect relationship is fading as researchers view unusually potent heat waves, droughts and downpours through the new lens of what could be called the science of extreme weather attribution. That’s the conclusion of a new analysis published Friday by the National Academy of Sciences, which assessed the scientific rigor underpinning a body of research work in this field. The report, “Attribution of Extreme Weather Events in the Context of Climate Change,” can be read without charge here. > MPR: Climate Cast: Why So Little Climate Coverage On TV News (Jessica Janoski). 2015 was perhaps the most newsworthy year for climate change in history. It was the second-consecutive hottest year on record globally. It was a record tropical cyclone year in the northern hemisphere. And we watched historic climate agreements at the COP21 meetings in Paris. And yet a new study from Media Matters says climate change coverage actually fell on network TV newscasts last year. On this week’s Climate Cast MPR News chief meteorologist Paul Huttner talks about the culture of TV newsrooms with longtime WCCO journalist Don Shelby, and with the director of the Center for Climate Change Communication, Edward Maibach. > LA Times: 13.1 Million US Coastal Residents Could Face Flooding From Rising Sea Levels, Study Says (Ann M. Simmons). A large new study warns that, with rising sea levels, large numbers of Americans could be forced to relocate to higher ground, including a million Californians. The estimated number of coastal dwellers affected by rising sea level is three times higher than previously projected, according to the study published Monday in the science journal Nature Climate Change. Findings from the National Oceanic and Atmospheric Administration revealed that if the sea level rose three feet by the year 2100, some 4.2 million people in U.S. coastal regions would be at risk of flooding. But if the sea level were to rise by about six feet, which lies at the higher end of projections by NOAA, then the number of those at risk of flooding would reach 13.1 million. > Star Tribune: Consumers’ Distrust Of Food Industry Grows (Mike Hughlett). Fifty-five percent of consumers agreed that they are becoming more distrustful of the food system, up from 48 percent in 2013, the last time Sanford Bernstein did such a survey. Compared to 2013, consumers also placed a higher priority on food that was free of genetically modified organisms, antibiotics, and hormones. Forty-six percent of consumers saw GMO-free as an important health concern, up from 42 percent in 2013, while 56 percent identified antibiotic and hormone free as important, up from 51 percent. > Des Moines Register: Cash-Strapped Farmers Struggle To Pay Cropland Rents (Donelle Eller). Faced with declining profits, some Iowa farmers are defaulting on cropland rents — a largely unheard of move given the intense competition for the state’s fertile farmland and a sign that financial pressure and debt are mounting. Farmers tell managers and landowners that bankers are tightening credit, with growing losses and dwindling reserves built up during farming’s boom driving lending decisions, experts say. U.S. farm income in 2016 is projected to fall for the third year in a row, with farmers squeezed between tumbling corn and soybean prices and stubbornly high costs for land, seed, fertilizer and other inputs needed to grow a crop, experts say. > Shareable: Sharing Power: The Crucial Challenge For Sharing Cities (Duncan McLaren). The more we think of ourselves as citizens, rather than consumers, the more feasible it is to resist and even reverse the dominance of commerce and money in politics. Enlightened Sharing Cities can help deliver this, involving citizens in co-producing governance through, for example, genuinely open consultations, open government initiatives, commons governance regulations, map-jams, and other ways of opening and utilizing the digital realm for citizen participation. Sharing Cities need to seize the moment; they must grasp the potential of participatory politics and make real the Right to the City — not just as an entitlement to share in the life, facilities, and resources of the city; but also as a right to collectively change and reinvent the city, its citizens’ identities, and their politics. > Peak Prosperity: Joel Salatin: The Promise Of Regenerative Farming (Adam Taggart). Front man for the sustainable/regenerative farming movement, Joel Salatin, returns to the Peak Prosperity podcast. Next month on April 23rd, he’ll be joining Adam, the folks from Singing Frogs Farm, permaculturalist Toby Hemenway, and Robb Wolf at a speaking event in northern California. He’ll be speaking on the power that’s in our hands to make much smarter choices regarding the food systems we depend on. > NY Daily News: Scientists Have Discovered Plastic-Eating Bacteria (Laura Bult). A group of Japanese scientists have discovered a new bacteria that is capable of breaking down PET—short for polyethylene terephthalate—the highly resistant material in plastic products that is a major environmental hazard. “The bacterium is the first strain having a potential to degrade PET completely into carbon dioxide and water,” Kohei Oda, one of the authors of the Journal Science study, told CBS News. Previously, scientists were aware of a fungi that could slowly decompose plastics, but this new bacteria, named Ideonella sakaiensis, would have more real-world applications. > Climate News Network: Renewables Ideas Make World Of Difference (Tim Radford). Carbon-negative cars, cost-effective organic solar cells and electricity from waste treatment are possible clean energy options as scientists stretch the laws of physics. Although these ideas are not currently developed, they are an indicator of ingenuity, imagination and resource that is repeatedly demonstrated in the world’s laboratories to confront the coming crisis of energy and climate change.